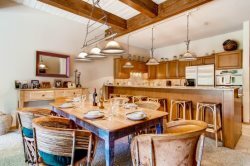 Ridge #34 - A luxurious Snowmass vacation condo. A premier Snowmass Village location. Left to right – Matthew Tate, Staci Stokes, Chessie Stokes, Stan Stokes. Matthew Tate, Broker Associate CBMM / Property Manager MMM, is a 10 year Roaring Fork Valley resident and has been buying and selling real estate for seven years. Matt received a degree in Finance and moved to Aspen, Colorado shortly after graduating from Indiana University. His time in Snowmass, Colorado and the surrounding area has allowed him to explore his love for skiing, golf, hiking, and all the great activities the area has to offer. Staci Stokes, Vice President / Co-Founder MMM, has spent most of her life in this small ski town. She and her husband Stan have worked together for the past 20+ years to start and maintain a reputable business here in Snowmass, CO. When she isn’t running the office, Staci is out and about teaching yoga at her studio or hiking around the village. Chessie Stokes, Property Manager MMM / Broker Associate CBMM, was born and raised in Aspen/Snowmass but also lived in Argentina for some time. She graduated from the University of Colorado at Boulder with degrees in Communications, Spanish and Portuguese. She wasted no time moving back to her favorite place on earth to be with her family and friends while skiing, hiking or just relaxing. Stan Stokes, President / Founder MMM, moved to Aspen/Snowmass thirty years ago and began Mighty Mouse Management a few years after that. Thanks to his upbringing in the metal fabrication industry he can fix just about anything. When Stan is not busy at work he enjoys skiing, fishing and playing golf. Stan is fortunate enough to have built lasting relationships in this small town and is so happy to call Snowmass his home.